Nepal is landlocked country, lying between India and the Tibetan Autonomous Region of China. The famous Mount Everest, the tallest mountain in the world is from Nepal. 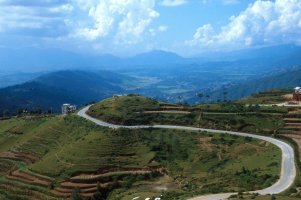 Along its southern border, Nepal has a strip of level land that is partly forested, partly cultivated. North of that is the slope of the main section of the Himalayan range, including Everest and many other peaks higher than 8,000 m.
Nepal is a developing country with a low income economy. It still continues to struggle with high levels of hunger and poverty, but despite all these challenges, the country has been making steady progress - to the best - over the years, with the government making a commitment to graduate the nation from least developed country status by 2022. To this day agriculture remains Nepal's principal economic activity, employing 70% of the population and providing 37% of GDP. And all this despite the fact that only about 20% of the total area is cultivable, another 33% is forested and most of the rest country area is mountainous. Rice and wheat are the main food crops. The lowland Terai region produces an agricultural surplus, part of which supplies the food-deficient hill areas. So, Nepal has got some sources of agricultural produce, but is still in need of other food products that can't be grown up on its hills. Over the years, Nepalese imports have increased substantially and undergone major structural changes. In other domains Nepal mainly imports oil and other petroleum products, gold, iron and steel, clothes, pharmaceutical products and medicinal equipment, cement, textiles, electronic appliances, transport equipment, food and vehicles. It is a member of Bay of Bengal Initiative on Multi-Sectoral Technical and Economic Cooperation (BIMSTEC), the South Asian Association for Regional Cooperation (SAARC) and the World Trade Organization (WTO). Nepal's trade balance is skewed towards imports, partly because the demand for industrial inputs and consumer goods has grown while local production has not. Nepal’s main imports partner is India, accounting for 58 percent of all imports. Other import partners of Nepal include China, Indonesia, Argentina, South Korea, Malaysia, Japan and Germany. Governments have attempted to increase export earnings by diversifying products, and also to reduce import costs by substituting imports with local production. Policies such as the Exporter's Exchange Entitlement Scheme and both a Dual Exchange Rate and a Single Exchange Rate were formulated to facilitate these objectives. To its credit, Nepal has obtained favorable agreements with its trade partners to offset its landlocked status. But the treaty crisis with India and the failure to agree on Bangladeshi access highlight the country's limited bargaining power. 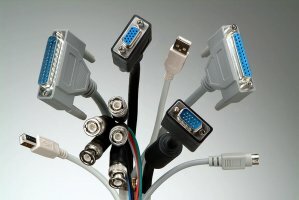 Still very much a developing nation, Nepal is unable to influence the global market to which it exports primary goods at prices that are generally both low and unpredictable; the geographical diversification of its trade needs to include a shift towards a wider array of manufactured products. Nepal is a landlocked Least Developed Country in Southern Asia, located between China and India. Exports consist of primary agricultural produce, while everything not produced locally is imported to Nepal. Thus, Nepal mainly exports carpets, iron and steel, beverages, textiles, tea, vegetables and plastic. Nepal main export partners include India, the US, Bangladesh, Germany, France, Canada, China and Japan. Nepal and India have long-lasting relations in trade and commerce. India is Nepal's largest trade partner, source of foreign investment and its main trading partner is India (accounting for 66% of all Nepalese exports). Exports to India from Nepal are generally supplied by agricultural surplus from the fertile Tarai region - it's mostly rice, but also tobacco, jute and vegetable oils. Raw materials such as hides, skins, herbs, textile fibers, metal ores, and some manufactured goods, such as bamboo products, wooden furniture, and textiles, are also exported. Imports consist of daily necessities such as salt, sugar, tea, medicines, petroleum products, and items such as chemicals, machines, cement, coal, and spare parts that are needed for development work. Export of Nepal mostly features ready-made garment is the topmost export item to overseas countries, followed by woolen carpets and pashmina. Other traditional export items to overseas countries are hides and goatskin, lintels, metal and wooden handicrafts, agro- and forest-based primary and secondary goods, leather, raw jute, lentil, large cardamom, ginger, tea and medicinal herbs. Coffee, honey, terry towels, micro transformers, blankets and buttons are emerging as new export items. The regular top ten exports of Nepal to India are textiles, ferrous metals, chemicals, rubber, plastic, crops, beverages and tobacco products, metals, vegetables, fruits, nuts, food products, minerals and leather products. Basically, its primarily commodities. Meanwhile, the top ten exports of Nepal to China are wood products, metal products, textiles, mineral products, leather products, wearing apparel, chemical, rubber, plastic, machinery and equipment, vegetable oils and fats and crops. Visualizing the scope of technology enhancement and production potentials, the upcoming export items are mushroom, saffron and floriculture products. Vegetable seeds, orthodox and CTC tea, essential oils from medicinal and aromatic plants, leather goods, woolen goods, silver jewelry and silverware, gold jewelry, etc also offer good export prospects beside the existing exportable items. Nepal, officially the Federal Democratic Republic of Nepal, is a landlocked country located in South Asia. 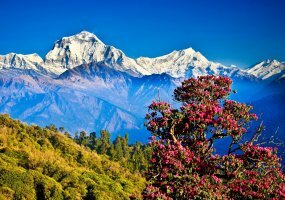 With an area of 147,181 square kilometres and a population of approximately 27 million, Nepal is the world's 93rd largest country by land mass and the 41st most populous country. It is located in the Himalayas and bordered to the north by China and to the south, east, and west by India. Nepal is separated from Bangladesh by the narrow Indian Siliguri Corridor and from Bhutan by the Indian state of Sikkim. Kathmandu is the nation's capital city and largest metropolis. Prevailing customs duty rates vary from item to item and can range from zero per cent to 130 per cent. An agricultural reform fee of 10 per cent of the imported value is levied on agricultural products. The prevailing exports service charge is 0.5 per cent but some industrial items, such as vegetable ghee and plastic goods, are liable for export duty of three per cent or two per cent. Excise and custom duties, levied on raw materials utilised by an industry for production of goods for export, are reimbursed after the goods are exported. The customs duty levied on goods imported to produce exportable industrial goods is also reimbursed after the goods are exported. A countervailing duty is levied on goods imported to Nepal from foreign countries. This duty is equivalent to the excise duty chargeable on similar goods produced within Nepal. A rate of 1.5 per cent of the imported value is levied as a local development fee. The Export/Import (control) Act of 1956 permits businesses registered in Nepal to import a range of goods, except goods which are either fully or partially prohibited. Livestock imports must be accompanied by a sanitary certificate issued by an approved authority in the country of origin and must be certified by an approved organisation. Leaf tobacco must be accompanied by a special certificate stating that the tobacco is free from ephestia elutella or that the pest does not exist in the country of origin. Port wine requires a certificate indicating alcoholic content. Spirits may need a certificate of maturity. Quotations are usually required to indicate FOB or CIF prices, with freight and insurance charges separately shown. This should be expressed in foreign currencies. Quotes to government agencies should be both FOB and CIF. Payment is normally by irrevocable letter of credit. Issued by local chamber of commerce. Three copies are normally required. Minimum of three original copies required. Non-negotiable copies as required by the bank (6-7 copies). Freight charges can be prepaid or payable at destination (CIF or FOB). Quantities must be indicated in metric terms as well as on a weight basis. Import reference number and letter of credit numbers are to be shown. Packing list is a compulsory document.